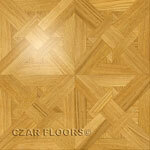 Parquet Flooring, Solid Wood Parquet Tiles | Czar Floors | Huge Selection. 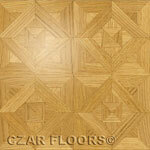 Parquet Floors from Czar Floors is an astonishing contrast to the ordinary hardwood floor. 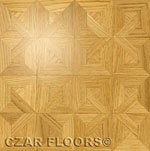 Czar Floors hardwood parquet is available in many modern patterns as well as classic European styles. 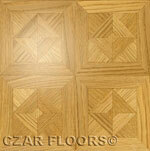 Parquet wood tiles are intended for glue-down installation over wood or concrete subfloor. Available in standard 3/4", 3/8" or custom thickness from a variety of wood species. Solid wood (no veneers) construction. If you need a custom pattern - we can make it for you. Check the traditional Herringbone wood floor for "Parisian" look and feel. 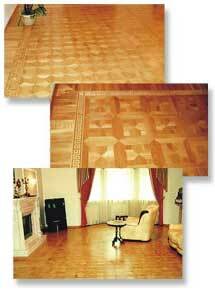 Minimum wood parquet floor order is 100sq.ft. 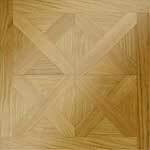 All parquet is made to order. 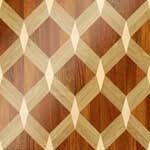 All prices for parquet flooring are per square foot. 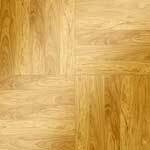 Standard parquet is supplied unfinished, plain sawn solid hardwood, face-taped, square edge, S4S straight cut (no T&G). We also offer the additional options of glued together solid modules, prefinished and T&G for an additional fee. However we recommend to use standard, unfinished material instead for the best results. 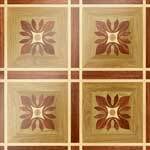 Parquet tiles sizes are differ by model. Please see each item details for specific dimensions. 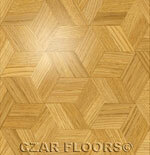 Parquet sizes other than shown are available for an additional fee. For radiant heated floors and critical applications we recommend to use rift/quarter sawn wood materials for the best results. Learn more about rift and quarter sawn wood parquet. 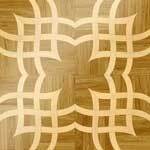 If you are interested in the custom parquet, please contact us. Please provide the following information for ordering: Czar Floor Model or your own sketch; Qty(sq.ft. ); Wood changes, if any; special grid size and thickness requirement. You may use the shopping cart or call us Toll free at 800-577-CZAR (800-577-2927) to place an order or make inquires. 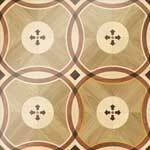 Parquet is a module made with multiple wood pieces that are assembled together to create a pattern. Common misspellings include “parkey,” “parkay,” and “parket.” A lot of people associate parquet with fingerblock square tile. 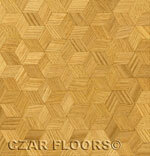 The most common and popular fingerblock parquet patterns are 12" x 12" and 9" x 9" parquet tiles. We offer this pattern in various configurations – see our M29 model. 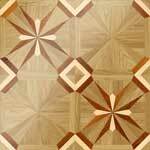 However, there are many parquet patterns available that you can select on this page. 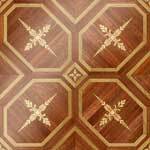 How to repair water damaged parquet flooring? 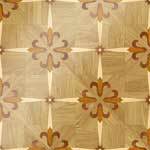 Water damage can ruin some old parquet tiles beyond repair. 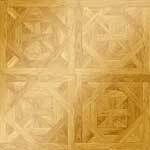 Typically, it is fingerblock parquet tiles like 9" x 9" or 12" x 12". 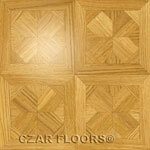 Czar Floors can custom produce parquet tiles in similar wood and dimensions. Please note that the minimum order is 100 sq.ft. Both old and new floors need to be resanded together and possibly stained, truing to blend old and new wood. 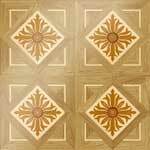 Initially, old tiles will look a lot darker from age, dirt and finish discoloration. After sanding and finishing, it should be pretty close to new flooring. The construction of out tiles may be different from the original, but the appearance from above should be similar. Being different batches of wood, it may still have a slightly different grain pattern and color. Unfortunately, if your old floor was refinished a few times and is very thin, you are better off replacing entire floor. 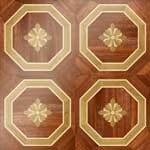 How to clean parquet floors? First rule – do not use water mopping or steam cleaners. Vacuum as often as you would your carpet. Don't use rotating brushes - turn it off if possible. Use specialized wood floor cleaning products such as Bona Wood floor Cleaner. 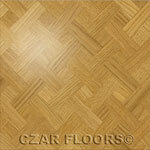 Download the Czar Floors Parquet Care Guide. 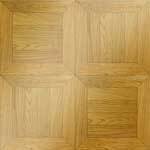 How to install parquet floors? 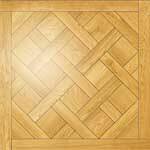 Check our Parquet Installation Instructions to find answers to the most common installation questions. 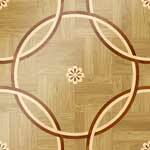 How much parquet do I need to order? Roughly measure the area you need to cover and add at least 10% extra for cuts and waste. If you need help calculating the amount of material for the room, please try our Floor Calculator or send us your measurements or drawings.